I'll be honest: I love Apple's hardware presentations. They're more polished and far more interesting than those by other vendors. That made Thursday's Apple event something I looked forward to. In September, Apple offered up new iPhones, new Watches, iOS 10 and macOS Sierra - leaving room for at least another fall event that would focus less on mobile, more on the desktop. 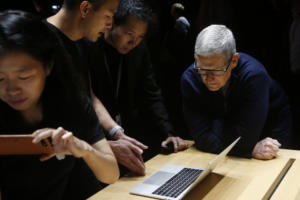 Hopeful Apple users weighed in online, eager to hear about new MacBook Pro laptops, maybe new MacBook Airs, updated iMacs, faster Mac minis, Mac Pro models with 2017 hardware and maybe even a replacement for Thunderbolt monitors. Apple's usual silence only served to hype the hype. What did we get? MacBook Pros. To be fair, the TV app for Apple TV and iOS devices looks like it's going in an interesting direction as Apple looks to unify in one place the content from across broadcast networks, separate apps and video services. Finding what you want to watch among disparate sources is important if the aim is to rework how we watch TV. But, disappointingly, it's not shipping until December. In other words, the announcement could have waited until the software was ready. Which brings us to the main, and only, event: the new MacBook Pros. Aesthetically and technologically, the new laptops are stunning. What's more stunning is that they were the only thing new to Apple's desktop lineup, much of which has gone without updates for years. There was no Mac Pro, no new iMac, or Mac mini. And Apple pointed would-be display buyers to LG hardware. What happened to the days when Macs were updated all at once, so there was consistency across product lines? You can't even plug in iPhones or the new EarPods with Lightning Connector to the new Macs without an adapter! (Ironically, the only other port on the new notebooks is the 3.5-in. headphone jack.) It shouldn't need to be said, but incremental updates to the Mac line-up would be welcome. It seems that Apple feels more frequent, incremental updates aren't important; that the cost of purchasing older chips (with ever-growing profit margins) help the bottom line more than a sales bump from a refreshed product. That's my theory; have a better one? But the lack of updated hardware is only one issue. While much of the new MacBook Pro lineup is very, very right, there are a few details that aren't. I'm going to focus on the 15-in. MacBook Pro. It's gorgeous, a remarkably lust-worthy design. If you haven't yet, watch this short product video. If you don't agree, then you clearly don't like technology and we're done here. Otherwise, I think we can all agree this notebook is stunning - in a good way. The 15-in. model weighs four pounds and is thinner than the previous design -- which was already pretty thin. It features a multitouch glass trackpad twice the size of previous models; larger keys on a redesigned backlit keyboard; a new, brighter Retina display with support for a wider color gamut and deeper contrast; Touch ID; and redesigned internals with increased throughput, and four Thunderbolt 3 ports. 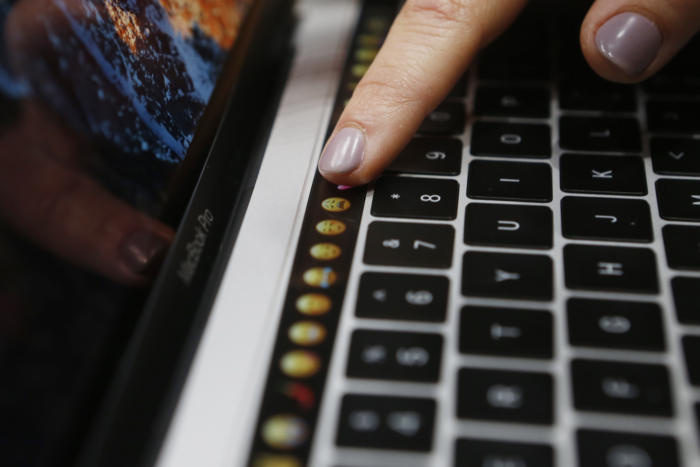 The best and most stand-out feature, of course, is the Touch Bar, a slim touch panel that acts as a replacement for the Function key row on the keyboard. A guest points to a new MacBook Pro during an Apple media event in Cupertino, Calif., on Oct. 27, 2016. The Touch Bar is contextually sensitive; its contents are based on whatever app you're in and the actions being performed. For instance, Photoshop will display buttons to activate popular actions and filter sliders; iPhone and FaceTime calls will display options to decline or accept calls, along with other actions; and Final Cut Pro will display the timeline when your edit window is full screen. This is oversimplifying actions you can take, and doesn't account for how third-party developers will make use of the feature. Overall, the Touch Bar is very clever. All of this adds up to a welcome and powerful redesign with some great forward-thinking features. So where's the problem? While an argument can be made that removing all ports except Thunderbolt 3 is inconvenient -- new dongles will be needed for every peripheral connected to your computer -- you can also argue that the benefits of Thunderbolt 3 outweigh that negative. A single port that does everything from video (up to two 5K monitors or four 4K monitors!) to data to power will be great if support catches on. What's not defensible about these Pro models is the storage capacity offered and the limited amount of RAM. Apple marketing chief Phil Schiller, in an email response to MacRumors on the subject, explained further: "To put more than 16GB of fast RAM into a notebook design at this time would require a memory system that consumes much more power and wouldn't be efficient enough for a notebook." That rationale strikes me as an odd case of form over function. If the memory controller needs additional power with 32GB of RAM -- and battery life would otherwise take a hit -- Apple could have modified the new case to make room for a larger battery. Or it could simply warn customers who want to upgrade about the potential trade-offs. Most users, myself included, would prefer more RAM to the new ultra-slim design. The problem is that while 16GB is fine for now, it may not be in two or three years, when many people could still be paying off this computer. 16GB was an enormous amount...in 2012. Today, it's average; tomorrow, who knows? Overshooting what is needed now extends the life of a computer, but anything beyond 16GB isn't even possible. The deepest cut, though, is price. The 15-in. MacBook Pro starts at $2399. That's a full $400 over the entry-level price of the previous model. The real kicker: It comes with just 256GB of storage. This on a rig aimed at photo and video professionals. Yes, you can always custom configure options or move to the next tier. The next model up the food chain has acceptable storage with 512GB. But it also costs an additional $400. Am I the only one thinking that in 2016, a computer costing over 2,000 should have 512GB of storage on the entry model? Apple CEO Tim Cook (R) views the new MacBook Pro in the demo room after an Apple media event in Cupertino, Calif., on Oct. 27, 2016. 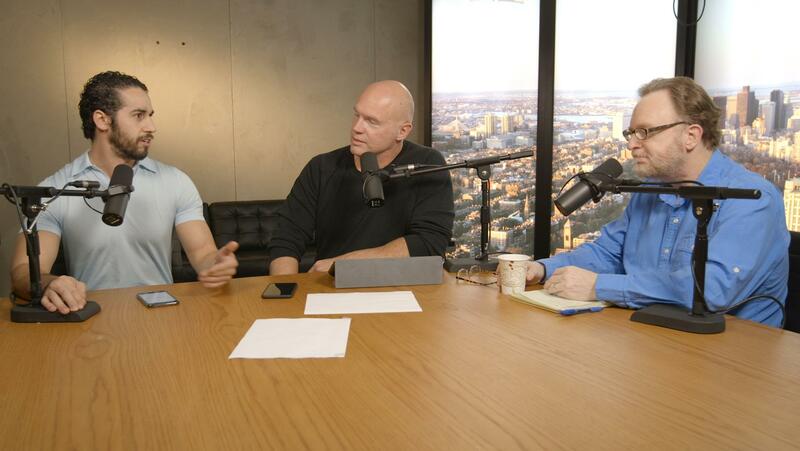 During a post-announcement interview, Schiller told CNet: Affordability is "absolutely something we care about. But we don't design for price, we design for the experience and the quality people expect from Mac. Sometimes that means we end up at the higher end of the range, but not on purpose, just because that's what it costs." With the entry model as-is, Apple pretty much guarantees that any professional on a budget will have to bring at least another hard drive just to get any work done. The insulting part is that Apple's products have profit margins of around 40%; it would be nice if Apple ate into that just a little bit to get a good customer-satisfaction-to-profit-margin ratio. 256GB of storage isn't enough. I don't doubt Apple will sell a ton of these notebooks, and I know they're packed with innovative technologies. But the entry-level specifications are reminiscent of Apple's iPhone line-up. Until recently, the entry-level storage for the iPhone was 16GB -- on a device capable of shooting 4K video. That's absurd, and Apple finally relented by doubling the entry-level storage in the iPhone 7 to 32GB. It's also worth noting that the graphics cards used in the Pro line-up - they're all from AMD's new Radeon Pro 400 range - are seen as capable, but hardly cutting edge. What to do? Would-be buyers hoping for more from the MacBook Pro line-up can, of course, wait for an update. But given Apple's history, who knows when that will be. The only product Apple consistently updates is the iPhone. Apple execs talk a good game regarding customer satisfaction, but the entry-level models unveiled on Thursday fall short. Apple's product matrix has always been set up to push buyers to the next model up, but in this case, the jump is too costly, and for that you get a slight processor bump and the storage capacity that should be standard at the low end. Long-time Apple watchers know the company has always operated like this; my argument is that with $237 billion in the bank, it can afford to make sure that its entire product line is "insanely great," not just the mid- and high-tier models.